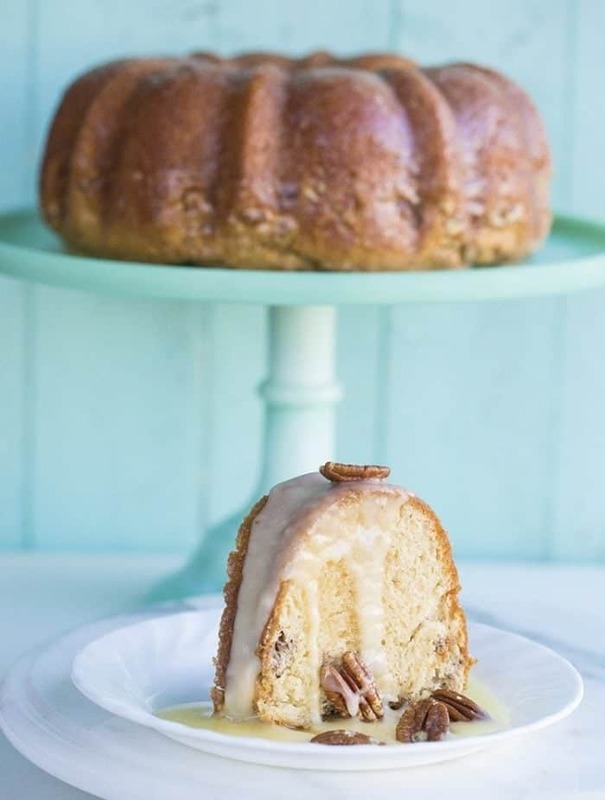 This pecan butter rum cake is probably the best cake I have ever tasted. I know it has a cake mix. I know it has a pudding mix. And yes, we then pour rum into it. Trust me when I say that sometimes cake mix recipes are GLORIOUS. 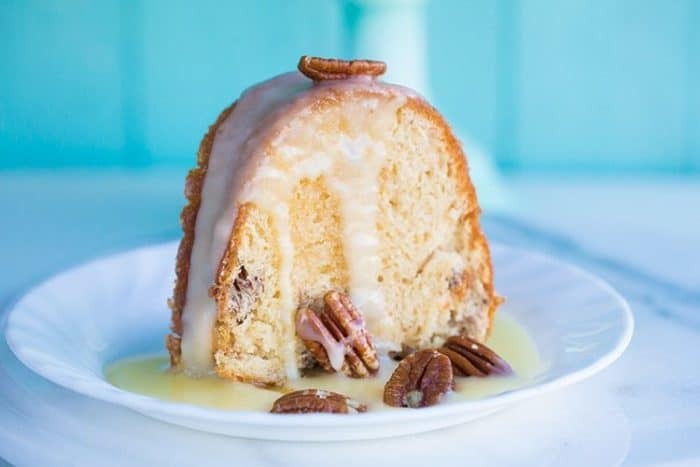 This pecan butter rum cake recipe is one of those recipes that you are just going to get over your preconceived notions about cake mixes. Hey, we all have those notions. Homemade is best, for sure, but sometimes…..sometimes my friends, a cake mix makes life and baking fun, interesting and basically downright delicious. This butter rum cake bakes up so light, yet saturated with butter rum bliss ( you let it sit for 12+ hours before eating it) that I don’t think homemade would work as well. The magic here is that by using a cake mix you get this light-as-air concoction. This recipe came from Rory, a lovely lady that used to work with my husband and word on the street is that she is famous for her rum cake at work. Famous as in if people know she brought it in, they kick, shove, bite and punch their way to the lunchroom to grab a slice. And that’s just when my husband gets wind of it. One would think I never made him anything to eat. I completely screwed up the amount of butter on the glaze the first time that I made this , I used half a pound instead of the 1/4! And it tasted great anyways. But yup, that’s me. Mike and I got so busy trying to figure out what 1/4 lb of butter was, that we confused ourselves and cut a half a pound. I can’t believe I poured half a pound of butter over the cake. When the cake is done, cool it for a minimum of 10 minutes, then invert it onto a plate. Poke holes in it all over. Slowly spoon the now-cooled glaze over the top of the cake, letting it soak in, scooping it up and re-soaking the cake if needed. The point is it let it get all soft and moist inside too. Then it looks like this! Now this cake has to sit before serving, and I would say at least a day. The rum flavor isn’t as strong, and the cake gets so moist, that 24 hours after I made it, it was perfect to eat. Sooooo yummy. Which Rum is Best for Cake? The best rum to use for a rum cake is a golden or amber rum that has lots of vanilla and caramel notes to it. Don’t use white as there is little flavour and a really dark rum could overpower this cake. Does the Rum in Rum Cake Bake Off? Nope! There will be still be alcohol in the cake and THEN you are pouring pure rum and butter on top. There is a lot of alcohol! Can You Get Drunk From Rum Cake? If you ate enough rum cake then I am sure that you could get drunk from it! To serve, I also make an extra rum glaze BUT you can skip this step if you want. I find that the cake is delightful either way, but sometimes I want that little extra icing on the top! Trust me, this is one amazing cake recipe! Happy Baking! 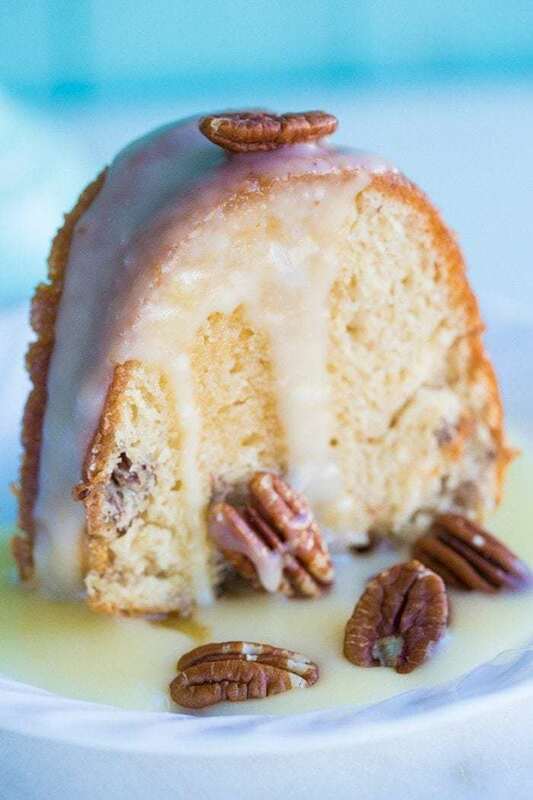 Deliciously easy and decadent pecan butter rum cake recipe! This is my most requested cake recipe ever, you can just barely taste the rum! 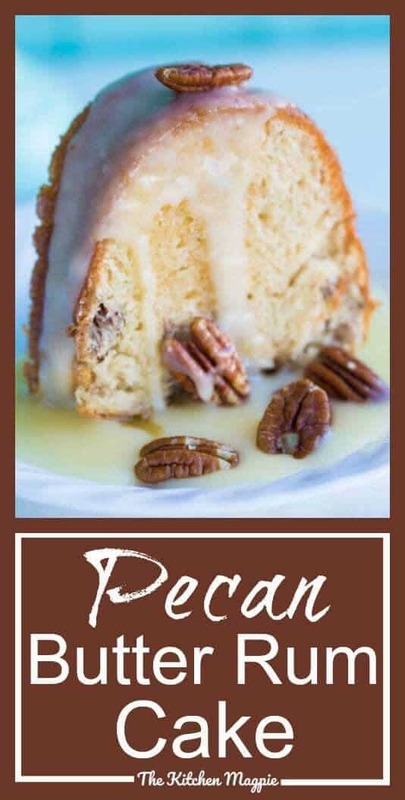 Top with toasted pecans if you like! Grease and flour a bundt pan and set aside. Pre-heat your oven to 350 degrees F.
In a large mixing bowl, combine the ingredients (excepting pecans) and beat until smooth, around two minutes. Bake in the oven for 35-45 minutes, until a cake tester or toothpick inserted comes out clean. Remove from the oven and cool in the pan for 5 minutes, then invert onto the plate you want to serve it on. Poke holes in the top. For the Rum Glaze, combine the first three ingredients in a pan. Bring it to a boil, boil for 5 minutes. Add in the rum at the very end and mix in. Pour over the still warm cake, spooning up any extra over and over again, until you get most of it soaked into the cake. Yes, this can be a pain but THIS is what makes the cake so darn good! Let the cake sit from 12-24 hours before eating. When you go to serve, you can mix up the icing ingredients and drizzle over the cake. This is optional! Try it with and without, you can't go wrong either way! If you don't let this cake sit, you won't like this recipe. The beauty of this cake is that it gets moister and more delicious the day after you put it together. The icing is optional, but I love it! Depends on your mood! 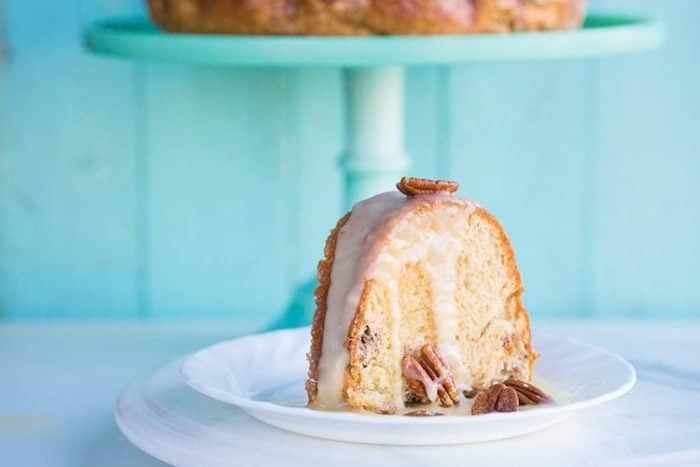 You can top the cake with pecans, just put then in the bundt pan and THEN pour the batter in. I find though that the cake glaze WON'T sink in and it misses the mark and beauty of this cake. You can try mixing them into the batter straight, but I like mine towards the bottom of the cake. This looks DIVINE. There is absolutely nothing wrong with mix cakes – some of my favorite quick bakes come from dressing up cake mixes. I HAVE to try this one, though, holy moly it looks good! Pecans are my weakness and butter rum sauce makes literally any dessert better. Bookmarking! Could you possibly use Rum Chata. It is a light beige colored rum? It is a Caribbean Rum with real dairy cream. Just trying to use up what I have. This will be a stupid question but is this safe for children to eat due to the alcohol content? I am thinking the actual alcohol would evaporate both in the cake and the cake glaze. My friend would make rum cakes for Christmas gifts but when her son got older, he would consume the rum before she could get her cakes made! She always but quality rum and she would be quite upset. She finally gave up and stopped buying the rum. Just a little humor to share with ya. Thank you. This looks devine!!!!! 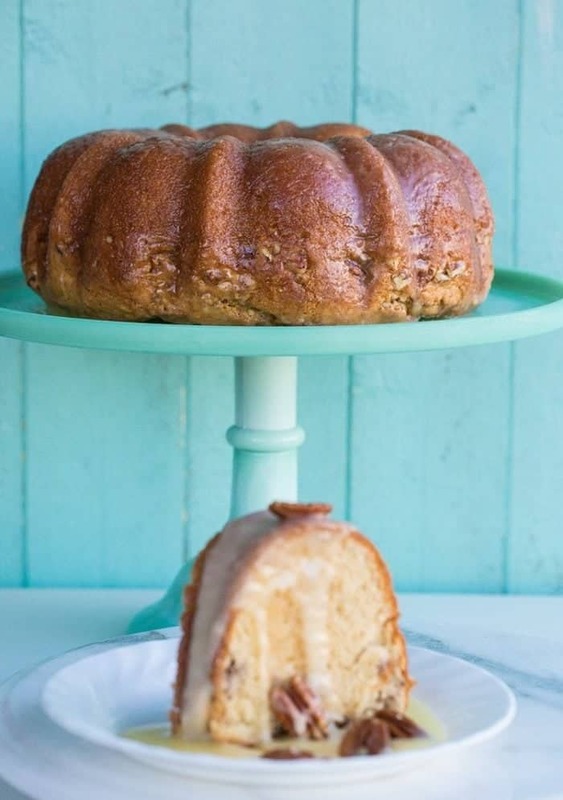 I love baking bundt cakes but I need a new bundt pan that is guaranteed NOT to stick!!!! Can you recommend which one to buy!!!! I have you cookbook and love it! I love vintage also. Thank you so much! Hello Karlynn, I stumbled upon this site and believe Me I’m Very Glad I did. After reading Your Bio. and about Your Husband designing the Web-Site. I discovered the video of Pecan Butter Rum Cake and watched it through. I don’t normally make My Own Birthday Cake but this one is a definite possibility. Sounds Delicious. I will certainly return for more of Your Delectable Recipes. That palette of colors is absolutely fabulous! Thank you for posting this recipe – I’ve got something to plan now 🙂 Hope you are enjoying your day! Hi Karlynn, I’m excited to try the rum cake and I’m hoping it is similar to the Burney Bros Rum Cake that I used to get 40 years ago in the Chicago Jewel grocery store. Should the cake be covered during the waiting period before eating? Do you use instant or regular pudding? Instant! I will edit that in. For the instant pudding how many grams or ounces for one package.? There were a few sizes to pick from. Thanks! this sounds delicious! but i didn’t see where you put the rum in the cake batter part? do you just add to batter? Sorry, just a quick one to say thank you so much for the time warning BEFORE the recipe, it’s such a nice touch and literally did just now save me going out to buy the ingredients and starting this to cook for a dinner party tonight.